210 suppliers of fastener and fixing products and systems took part in the show, filling the venue’s South Hall. While 22% of exhibitors were foreign companies representing 13 countries, participation by Italian firms increased compared to the 2016 show, confirming that Fastener Fair Italy is now established as the reference point for the market in this country. Among foreign nations strongly represented were Germany, Turkey, the UK, and Spain, while companies from Slovenia, Denmark, India, France and the USA also took part. Leading industry associations supported the event and welcomed delegations on their stands: the Italian Union of Fastener Manufacturers U.P.I.V.E.B., the Italian Union of Fastener Distributors U.D.I.B. and the Italian Association of Metal Finishing A.I.F.M. The mix of visitors to the show reflected the diversity of markets served by the fastener and fixing industry. The majority of visitors were either wholesalers (24%) or distributors (42%), all playing a vital role in the supply chain to resellers and end-users. Around 20% were end-users themselves. Fastener and fixings manufacturers accounted for 34% of those attending. A significant number of visitors – 28% – were foreign, representing 62 countries. The visitor quality was also noteworthy, with managing directors, partners and board members accounting for 38% of those attending the show. Heads of departments and senior managers totalled 17% of attendees, while a further 11% were engineers and technicians. Almost 18% of visitors represented Procurement / purchasing departments. The most strongly represented industry sectors were the automotive industry, construction, mechanical engineering, hardware / do-it yourself retailing, electrical products / domestic appliances, aerospace, agricultural / off highway machinery and furniture manufacturing. Exhibitors were delighted to welcome high calibre Italian and international visitors, including the science-based technology company 3M Italia, the multinational corporation ABB S.p.A., the world’s leading chemical company BASF, and top global engineering companies Ansaldo Energia, HILTI Corporation, and Altran Technologies. Among automotive companies represented by visitors were Ducati Motor Holding, LISI Automotive, and IVECO S.p.A. Buyers from the well-known appliance manufacturers Electrolux and De’Longhi attended the fair, as did technical specialists from IKEA Components. In addition, there were visitors from the multinational steel manufacturers ArcelorMittal and Aferpi Steel Company. Local and international representatives of leading fastener distributors and manufacturers, including Würth, Fontana Gruppo, Stamperia Carcano Giuseppe, F.lli Mauri, A.Agrati S.p.A. and many others also attended the show. An accompanying programme of technical seminars added a further important dimension to Fastener Fair Italy. These proved to be highly popular, attracting a total of 175 delegates over the two days. Three sessions were devised by Show Partner Fasten.it (www.fasten.it), providing insights into issues currently affecting the fasteners market. These included seminars curated by A.I.F.M. Associazione Italiana Finiture dei Metalli, E.C.A.P. European Consortium of Anchors Producers and Kistler Group. Also, selected exhibitors took to the big stage with their most innovative ideas and solutions – the experts from Coventya Group, Atotech Group, Frontline Consulting and Filtereco Filtration Technologies presented the latest solutions to the issues concerning the fastener and fixing sector and related industries. Dates have now been set for the next Fastener Fair Italy. The third show in the series will take place on 11 and 12 November 2020. The venue will be Fiera Milano City and there has already been very strong demand for stand space. Following the success of the show, some 50 companies have confirmed their participation in Fastener Fair Italy 2020, with around 1,900 m² already booked. In response, this next exhibition will occupy a large Pavilion 3 to provide additional stand space. Fastener Fair Italy is part of the worldwide series of Fastener Fair events organised by Mack Brooks Exhibitions for the fastener and fixings industry. These include Fastener Fair France, Fastener Fair Turkey, Fastener Fair India, Fastener Fair Mexico, Fastener Fair USA and the flagship event Fastener Fair Stuttgart, Europe’s leading international trade show for this sector. 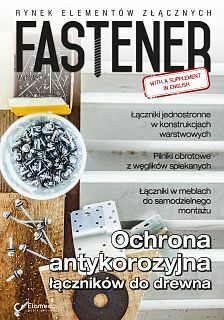 Additional information on Fastener Fair Italy 2020, including details of exhibition stand options, will soon be available on the show website www.fastenerfairitaly.com.